Those of you who know me, know that I eat a lot of raw foods. I am a huge believer in everything in moderation...except with my fruits and veggies! Those...have not limit...sort of. So, I thought I would share a couple of things I have found just recently while playing in the kitchen. Remember the miniature orange pound cakes I made last week? Well, after zesting and juicing the oranges, I cut up my cantaloupe on the same cutting board. I thought nothing of it, I just figured I would use the same cutting board since I already used it for fruit. As I was eating it, I thought...this cantaloupe tastes amazing. The flavor was so bright and slightly sweeter than others I had before. Then I noticed there was orange zest on it. 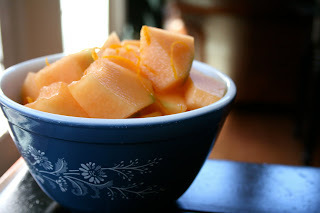 Oh My Gosh...the orange completely brightened up the flavor of the cantaloupe! So, the next time I cut up my cantaloupe...let's just say it was not an accident that orange zest and juice got on it! Then I thought about orange zest and what kinds of good stuff it might have in it. Turns out the zest is really good for you. It has components that are said to lower cholesterol, reduce bone loss, act as an anti-inflammatory, the oils are good for your skin...all this and tastes good too. So, I am definitely adding this to more fresh and baked goods! Now, I know this is not the most attractive when it comes to photos. I really was just playing around, but I made hummus the other day and decided to throw in a few extra things. The illustrator and I have been talking about our favorite flavors on pizza lately (since we are on a pizza craze). Our favorites seem to be fresh green pepper, red pepper and onion. So, we thought we would do a play on that in some of our hummus. Well, it is not as much of a hummus (due to the water content in the additions) as it is an amazing dressing for my salad! 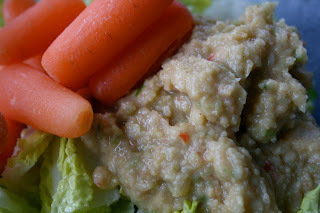 Wow, the flavors really pop and the use of the chickpeas as a base helps it coat the lettuce! Not to mention, it is dressing that has protein in it and is only 55 calories for 1/3 of a cup. I am really happy about those numbers! I have a little of the hummus dressing left over and Friday night is pizza night, so I am going to save a little for my pizza topping...can't wait for pizza night! makes 3 1/3 cups...a lot! Don't judge me...I eat a lot of hummus! Serena, this looks great! I love the combo of lemon and cumin! I am always looking for new ways with hummus, and this one sounds like a winner! And orange zest really does add a beautiful zing, doesn't it? Hummus rocks! That's so interesting about the orange zest on your cantaloupe! 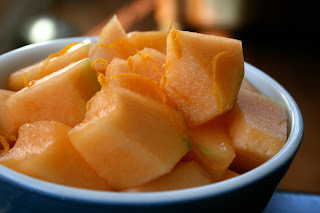 I love cantaloupe, I don't know why I don't eat it more often. I've been very interested in raw foods lately, not as a completely lifestyle, but incorporating more of them into weekly menus. So good for you! Hello. I just found your blog and am in awe at some of the foods and desserts that you have made. I have neve tried to use cumin in anything before. Maybe I will have to try it sometime. oh I'd love some of that! great eats my friend!